Your parcels arrive via DPD and/or its partner firms, which usually deliver them in the morning. If no-one is there when they arrive, a second delivery attempt is made. 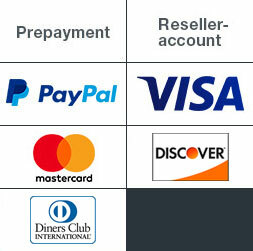 At PrintCarrier.com the delivery costs are always inclusive in the prices shown on the online shop! Exemption to this are our products made of newspaper paper, as these will be delivered on pallets. We do everything possible to make sure that your goods arrive in perfect condition. They are packed in extra-strong cardboard boxes that are additionally protected by special ribbons. Is it possible to bundle print products? Folded leaflets and brochures printed on 135gsm or 170gsm paper can be provided in bundles of 50 or 100. This option is a good idea if you are planning to distribute equal quantities to multiple locations. Is it possible to have goods delivered to another country? Unfortunately, it is not possible for you to request delivery to a different country. We also operate shops for the countries listed below. Please note, however, that for tax reasons you must specify an invoicing address in the country concerned in order to use its shop. Can I choose the return address on my shipment? The default option is for parcels to be sent with our logo and address on them. You can choose one of the other options, however. With neutral shipping, neither our logo nor any other return address appears on the parcel. If you want your customer to see right away that the shipment is from you, choose your invoicing address or any other address as the sender. These options are ideal for resellers. Is it possible to have a parcel resent if delivery of it has failed? Can I combine multiple products in the same order? For production-related reasons, this is unfortunately not possible. Ordering products separately always has the advantage that each of them will be dispatched as soon as it is ready. You receive a different order number for each product.